I wasn't expecting much from this movie when I first went to see it in the theater for a few reasons, but I was pleasantly surprised. I felt that the story for the original Disney animated version wasn't quite as strong as it could be. The tiger Shere Khan just shows up out of nowhere and that prompts the wolves to send Mowgli off to live in the man village. Then Mowgli ditches his protector, the panther Bagheera, to head off on his own even though he knows he can't go back to the wolf pack. This movie changes all that. This new live-action version changes those plot points so that they make more sense. I also didn't care for all of the musical parts in the original and thankfully this version only King Loui and Baloo's musical numbers, both good songs. Finally, I wasn't looking forward to all of the computer generated animals and environments, but I was totally blown away with how realistic everything looked. It was so well done and everything looked so beautiful. 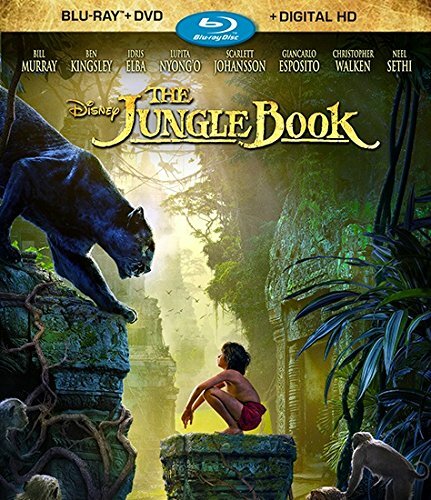 The story in this version is similar to the story in the original Dinsey film in that a young boy named Mowgli is raised by wolves until one day he must leave his wolf pack and head to village of people in order to be not be killed by a fierce tiger named Shere Khan who hates all humans, even the young ones. In this adventure he is accompanied by his friend, a panther named Bagheera, and meets several other characters such as the giant python Kaa, the lovable bear Baloo, and the giant orangutan King Louie. Baloo, voiced by the wonderful Bill Murray, is my favorite character as I felt he had the most personality... or it could just be because he reminds me of one of my uncles. The kid who plays Mowgli is outstanding, it's like they used magic to pull the cartoon kid out of the animated version and into real life. And he plays extremely well all of the CG animated animals, which as I already stated are superb. Even when they are touching each other you just cannot tell the difference between what's real and what's CG. There's really only one thing that kind of bugged me in the movie and that happened towards the very end, and that the amount of time it took Mowgli to get from the human village back to his home in the forest. Didn't it take like days for him to get from his jungle home to the man village, and then he makes it back in what, half hour? So that part kinda bugged me. But the rest of the film was fantastic. Audio Commentary - This is all director John Favreau, and while I tend to prefer group commentaries to solo commentaries his is pretty good, it's very informative. The Jungle Book Reimagined - This is a featurette where the makers of the film talk about the concept and production. It's also pretty good, and is about a half hour long. I thought this was a great movie, and even if you weren't a huge fan of the original Disney animated version I think you'll like this one.